Foam and thermoformed plastic are both used extensively in the packaging of electronic products, however they serve extremely different purposes. Depending on the unique application or the specific needs of a customer, UFP Technologies can recommend which material or which combination of materials will deliver the best results. For starters, the most basic function of foam packaging is to extend the time of speed reduction and thus reduce the rate of deceleration. The thicker the foam, the lower the deceleration. Established by drop testing, foam is able to dissipate the energies of an impact and thus spread the absorption out over time. The unique properties of foam allow it to absorb both shock and vibration, while providing superior cushioning and protection. 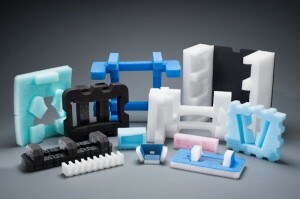 Foam is inherently resilient, and depending on the type of foam, can also protect against abrasion, thermal damage, moisture damage, ESD, and more. By offering both cushioning and resiliency, foam packaging is ideal for electronic products that require extensive protection throughout their entire life cycle, from manufacturer to end user. The excellent vibration dampening qualities of foam allow it to offer advance cushioning protection throughout the shipping, material handling, and transit process. UFP Technologies also has access to a variety of specialty foams that are Electrostatic Discharge (ESD) protective including anti-static, static dissipative, and conductive. Our engineers use these foams often for electronic applications in order to provide ample cushioning protection, while preventing any potential electrical charges from interfering with and damaging the quality of the product. On the other hand, thermoformed plastics are also commonly utilized in the packaging of electronics but offer a very different kind of protection. 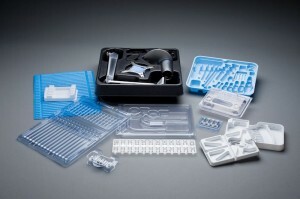 In regards to electronics packaging, the main purpose of thermoformed plastic is to hold the electronic contents in place and to prevent the contents from banging into one another. Applications of thermoformed plastic do not call for as much cushioning compared to foam, but instead require a strong structure. And although thermoformed plastics are not inherently resilient, UFP Technologies has the capability to build resiliency into thermoformed plastics with the “geometry” it incorporates into each design. We have access to an array of rigid, rubber and corrugated plastics that we utilize for creating custom electronic packaging solutions. For example, our engineers use ABS (Acrylonitrile-Butadiene-Stryrene), a thermoplastic that comes in conductive and antistatic grades, for material handling applications and housings for computer systems. Our access to a wide variety of materials allows us to produce both thin- and thick-gauge thermoformed electronic packaging and component solutions. These two materials offer very different benefits yet are both extremely effective packaging mediums. Choosing the correct material depends greatly on the specific application and what it requires. With access to different types of foams, thermoformed plastics, and a wide range of other specialty materials, our packaging experts can offer the optimal solution for protecting any electronic product or component. Good article with basic information and possible options for each material. Any thoughts on market trends toward or away from one of these options?